The Jaguar Land Rover petrol line in Ford Bridgend Engine Plant will temporarily suspend work this week. Ford opened the Bridgend Engine Plant to build its own petrol units in 1980 and won the JLR engines contract a decade later. 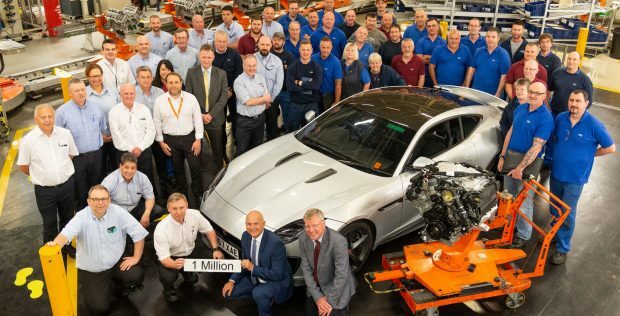 Earlier this year (above) it celebrated making the millionth V6 and V8 engines for the premium brand, but the programme will conclude by 2020 and then BEP will fall back on work for Ford models assembled around the world. Line workers were last week told not to report for work, although they will still be paid a basic wage, following the collapse in vehicle orders for Jaguar Land Rover models which have been put on hold in the Midlands and North West vehicle assembly plants. The production halt on JLR lines comes as Ford today launches in Bridgend its new Dragon line for its next generation petrol engines for its own vehicles. Capacity on this new line was installed for 250,000 units annually but it will start with the objective of half that number and build up as demand for petrol engines is expected to gradually rise because diesel engines are falling out of favour across Europe, according to the latest JATO figures.